Tokyo weather at New Year’s is usually fine, lending itself to outdoor activities. One popular activity for family or friends is to walk a fixed course of shrines and/or temples, usually all in the same neighborhood, each honoring a different one of the seven lucky gods. Popularized during the Edo Period (1603-1868) such a walk is meant to get the year off to a good start. Minato, a central ward of Tokyo, is home to embassies, hospitals and universities as well as several of Tokyo’s most popular shopping and entertainment districts. As an area with deep roots in old Edo, it also offers a New Year’s seven lucky gods pilgrimage from January 1 through Coming of Age Day (in 2018, January 8). This walk can be done in 2 to 2 1/2 hours, or make a day of it by stopping to explore along the way. Just remember to finish by sunset (or 2 p.m. on January 8), when the shrines/temples close. At each destination, collect an inscription (300 yen each) on a shikishi (special white card that you get at your first stop), to commemorate your pilgrimage and create an attractive keepsake. You can have your inscriptions on a decorated scroll (suitable for framing), if you prefer. At some of the shrines, you can buy a small bisque figurine of the relevant lucky god, containing a sheet telling your fortune. Amulets depicting each of the lucky seven, or their treasure boat, are also on sale at most shrines. 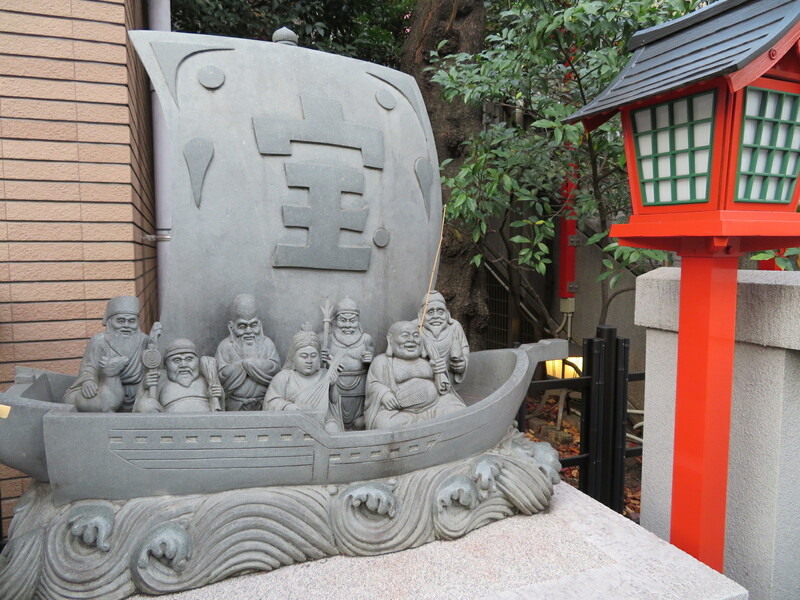 Although there are seven so-called lucky gods, this walk has eight stops, including one for the treasure ship that is also associated with the seven lucky gods. It is said that the lucky seven sail their treasure ship laden with gifts and good fortune into harbor on New Year’s Day. The eight destinations can be visited in a roughly circular course, and pilgrims can start pretty much anywhere and follow it around. But the friendly and helpful monk at Hojuin Temple advises that most people prefer to begin at Hojuin and move counterclockwise, finishing at Juban Inari Jinja so that they can shop and eat in the upscale Azabu Juban area when they’re finished. This article follows that suggestion. 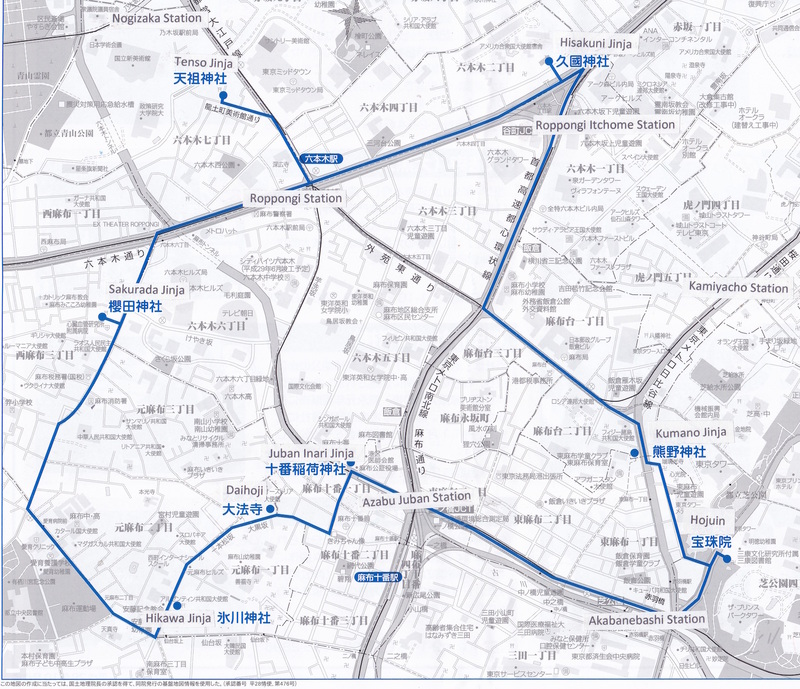 Hojuin is located in the shadow of Tokyo Tower, about a five-minute walk from Akabanebashi subway station. As a temple it has more than 1,000 years of history, for much of which it was a part of the Zojiji Temple complex, which was broken up with the suppression of Buddhism during the early days of the Meiji Restoration in the mid 19th century. The temple itself is small and looks a bit neglected. In fact, it is slated to be torn down and rebuilt soon. The temple’s principal treasures, including a statue of Benten, the goddess of music and fine arts, are already out being restored, with only effigies left inside the temple for worshippers. Near the temple is Benten-ike, a small pond that was once much larger and contained a small island on which stood a small shrine to the goddess. Benten is usually to be found near or surrounded by water. Another interesting feature here is the small stand on the front steps of the temple, provided so that visitors can take selfies with Tokyo Tower in the background. Less than 10 minutes from Hojuin is the second destination, Kumano Jinja. This is a satellite of the three Grand Shrines of Kumano on the Kii Peninsula, that have been a popular pilgrimage destination for more than a millenium. The exact history of this shrine, now a small structure wedged between two modern buildings, isn’t well known because its records were lost in a fire in 1703. The lucky god to worship here is Ebisu, the god of commerce and fisheries, a logical choice in this predominately commercial district not far from the bay. This shrine takes its name from a 12th century swordmaker. It is said that the 15th century samurai warrior-poet Ota Dokan gave the shrine his 12th century sword forged by the master swordmaker Hisakuni, resulting in the name of the shrine. 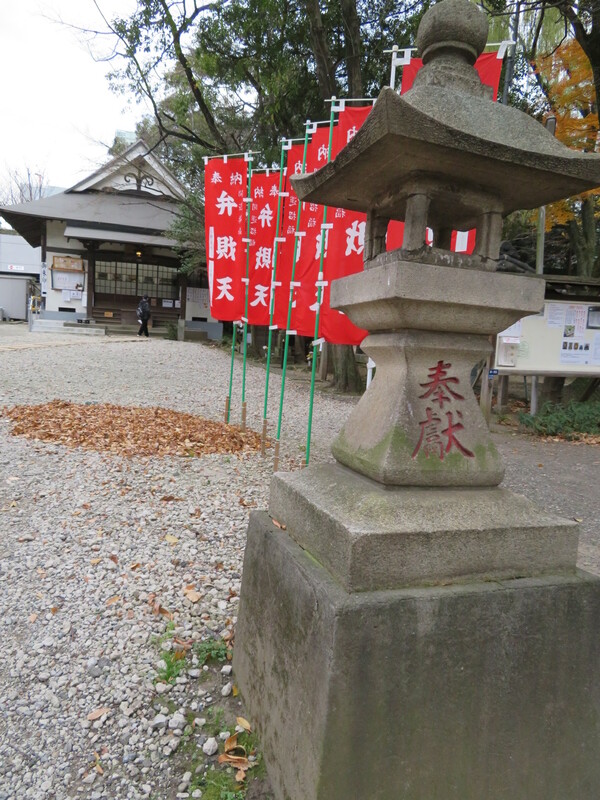 This is a small shrine that is particularly popular at New Year’s. This is where you get an inscription for Hotei, the god of happiness and contentment. Some say Hotei is the Bacchus of the 7 lucky gods, perhaps fitting since your route next takes you through Roppongi, that most bacchanalian of Tokyo destinations. Tenso Jinja is down a small side street not far from Tokyo Midtown. The Suntory Art Museum at Tokyo Midtown, the National Art Center and the Mori Art Museum at Roppongi Hills form the three points of “Art Triangle Roppongi”, so if you fancy a bit of culture as part of your day out, consider dropping in to one of these three while you’re in the neighborhood. Tenso Jinja dates to 1368 but has been integrated into the new Tri-Seven Roppongi complex in a delightful blend of antiquity and modernity. 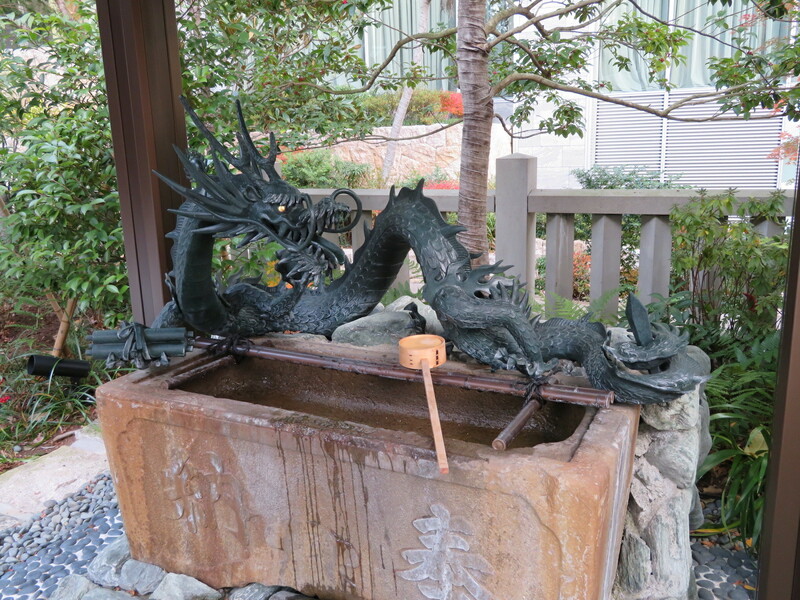 There is a legend that a dragon (ryu) used to fly from Edo Bay to this shrine every night to light a candle, so another name for this shrine is Ryudo Shinmei-gu (dragon light shrine). 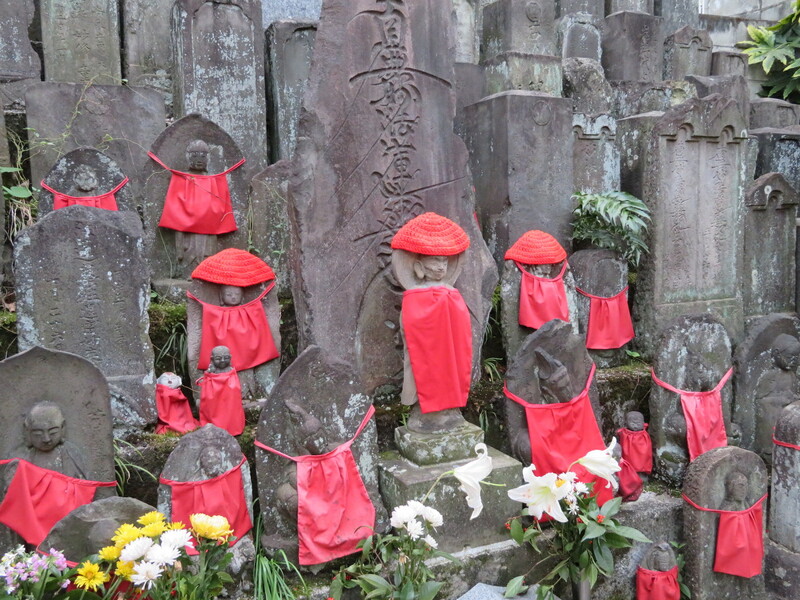 At Tenso Jinja the lucky god is Fukurokuju, the god of happiness, riches and longevity. It is said that Fukurokuju has the power to revive the dead. Sitting in such close proximity to Roppongi, one wonders how he does with the dead drunk. Sakurada Jinja, the next destination, sits across from the entrance to the Grand Hyatt Hotel at Roppongi Hills. While the shrine has nearly 1,000 years of history, it was moved to its present location in 1624. It probably looked large and resplendent at that time, but seems to have shrunk as larger buildings have surrounded it. A print in the window of the shrine office depicts the shrine in its earlier days. The lucky god here is Jurojin, the god of longevity, fitting for a shrine that has survived in such a rapidly changing neighborhood. Continue down the road past the Chinese embassy. To proceed directly to the sixth destination, turn left at the traffic light labeled “Aiiku Hospital”. If you want another little deviation, continue straight ahead to reach Arisugawa Park on your left, once the estate of Nambu Minonokami, the lord of Morioka. The property passed to the Arisugawa line of the Imperial family at the end of the 19th century and was donated to the city of Tokyo for use as a public park in 1935 on the 40th anniversary of the death of Prince Arisugawa, an instrumental military leader in both the Boshin War (1868-69) and the Sino-Japanese War (1894-1895). Leave the park from the opposite side of your entry and continue left up the hill to rejoin the pilgrimage route. At the traffic light labeled “Sendaizaka Ue”, turn left. Hikawa Jinja is about 80 meters ahead on the right, after you pass a vine-covered stone church on the left, the 1917 Ando Memorial Church. 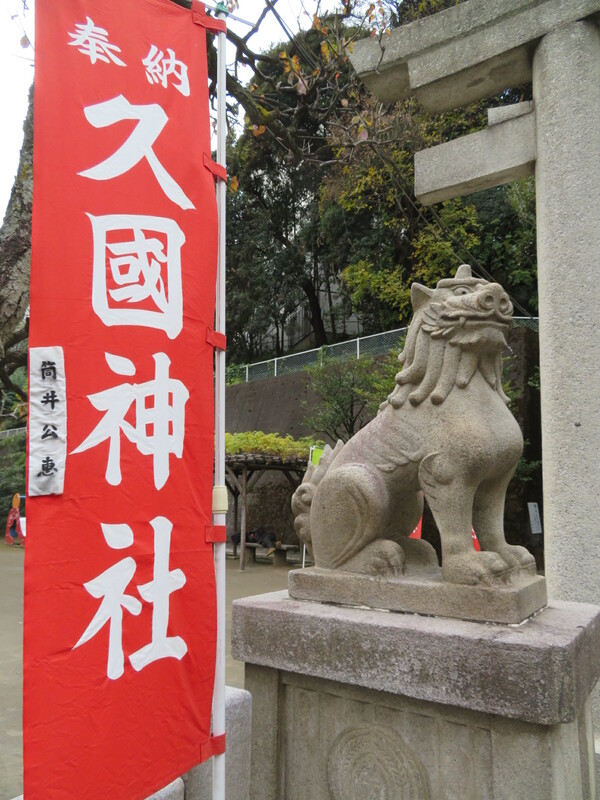 There are several Hikawa Shrines in Tokyo, this one, usually known as Azabu Hikawa, traces its history to 939. Here you can collect an inscription to Bishamonten, the god of war and warriors. This shrine is also home to an elaborate festival float, but these days is perhaps better known--at least by fans of the Sailor Moon manga--as the model for the Hikawa Shrine where Rei (aka Sailor Mars) works as a shrine maiden. It is another place that offers a contrast of old and new, as it sits in the shadow of the distinctive Moto Azabu Hills Forest Tower. Continue on this road to reach the second and last temple of this pilgrimage. You will pass the Nishimachi School, which was founded in 1949 to offer international-style education. The school’s founder, Tane Matsukata (1918-1989), was the granddaughter of Matsukata Masayoshi (1835-1924), Japan's 4th prime minister. Part of the school’s campus is the former Matsukata family home. A little further down the road on the right is a single tall pine tree (ippon matsu). This part of the hillside is known as ippon matsu zaka, as there has long been a single pine tree growing here (though not always the same one—apparently it is replaced as needed). Continue down hill, bearing to the right at the wooden hill marker that says “Daikoku-zaka.”.Just a little further down on the left is a small shop called Bamboo House Megumi, which sells delightful traditional Japanese trinkets. The perfect place to find something to adorn your house in the new year. Next door is Daihoji, a temple founded in 1597 and home to Daikokuten, the god of wealth, farms and the kitchen. From Daihoji to your final stop, Juban Inari Jinja is a relatively short walk that takes you through the maze of streets that form the commercial district of Azabu Juban. By now you could be short on time, so you may want to complete your pilgrimage first and then return here to shop or dine. As you walk through, you’ll notice shops selling everything from pets to paper, hardware to haute couture, and candies to crafts. And plenty of restaurants to choose from as well! One could spend hours exploring. But first, visit Juban Inari Jinja, on the hillside above Exit 7 of Azabu Juban subway station, to collect an inscription for the treasure ship. This is another rather small shrine, with quite steep stairs approaching it. Don’t miss the splendid stone carving of the treasure ship carrying the seven lucky gods, which sits to the left at the base of the stairs. Once you’ve got this eighth inscription, you have collected the luck of all seven gods as well as the fortune carried in their treasure ship. That should certainly be enough to carry you to a successful 2018! Vicki L Beyer, a regular Japan Today contributor, is a freelance travel writer who also blogs about traveling in Japan. Visit her blog at jigsaw-japan.com. Certainly an interesting walk and all shrines and temples make sure that there are plenty of opportunities for you to spend your money.